The Rossi v. Industrial Heat, et al. case in federal court in Florida has resulted in the release of numerous exhibits. In fact, over the past week there has been almost too much to speculate on as both sides can be inferred as making compelling arguments for and against their claims. This is very typical of the U.S. adversarial judicial system where the truth unfortunately matters less than mounting a vigorous legal attack and defense. Among the documents is the final report of one Fabio Penon, who was the mostly absentee professional chosen as the Expert Responsible for Validation (ERV) by both sides. The report claims the “energy multiple was always higher than 6” and the temperature of the steam produced was in excess of 100 degrees for the 350 days. In fact, on most days the reported COP was in excess of 60, which is a shocking number for many reasons. You can decide for yourself the veracity of this report by reading it here and all the other court documents. Since we last wrote, there continues to be important developments. The rest of the world is waking up that L.E.N.R. is serious. A recent Forbes article emphasized the maturing of the technology. And OilPrice.com journalist Brian Westenhaus thinks the industry may have reached the turning point and perhaps the last stages before widespread acceptance. This is further supported by an influx of universities in the US and afield that are now including LENR or Cold Fusion studies in their syllabus. The 18th International Conference on Cold Fusion (ICCF-18) held last month also provided substantial details of the technology along with deepening understanding of the physics behind it. In practice no-one is yet able to match the COP that Rossi has attained: COP=6, but we hope that all parties do succeed because there is much need for more efficient and environmentally friendly energy sources. Our focus has continued to be on working with interested parties, discussing their needs and recommending solutions. The following diagram shows the wide applicability of the Rossi E-Cat and Hot-Cat. Many companies around the globe and in this region are starting to focus on co- and tri- generation, the situation where one heat source is used over and over again. 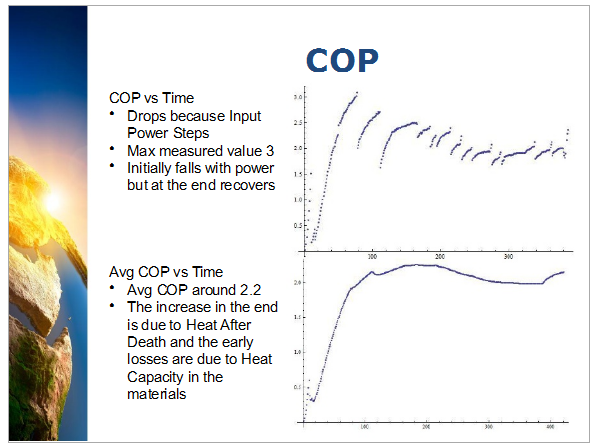 To this end the actual effective COP can be much higher than 6, if one can re-use the heat. 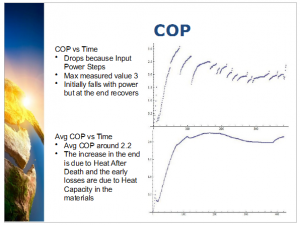 A typical co-generation use could be using the initial heat for a food manufacturing process, and the waste heat for a chilling/refrigeration process. Consider a typical Co-Generation opportunity: Fruit and Veges industry. Primary Application: Blanching. For this, typically they would be using grid electricity, or Gas. With the E-Cat they would enjoy a COP of 6 (i.e. for every unit of energy previously used, now they can consume just 1/6th of that energy, reducing their bill proportionately). Once used the energy they have consumed is typically wasted. Secondary Application: By coupling the blanching process and its waste heat, to a chiller system, the company can convert this waste heat into chilling, allowing operation of cold rooms for holding vegetables, at almost no additional energy cost. Assuming a 70% efficiency on this leg, the company might be able to get an additional 50% re-use of the energy (allowing for inefficiencies). Now the company may also consider that there is a third use for the same energy – output from the Chiller is hot water (approximately 50-70 degrees C). This is ideal for general use in bathrooms and kitchens for washing and cleaning. Notice from the example table above, that there is substantial improvement of the facility’s energy use. Using the E-Cat, the company may be able to achieve upwards of 10 times the value of the input energy. (note this is a generalized example. Engineers will be able to estimate specific applications which depend on environmental conditions and other factors). E-Cat Australia and South Asia is working with manufacturers and distributors of allied equipment to assist our clients get additional benefit when they implement an E-Cat or Hot-Cat. In an audio interview today, Andrea Rossi answered questions on the Ecat, Hot Cat and Leonardo Corporation’s operations in LENR. 2). The Leonardo Corporation guarantees a COP of 6. 3.) U.S. Partner plans to sell its heat to customer at temperatures of 102-130 C.
4). The Hot Cat works at very good stability at temperatures of 350 C.
5). The infamous Hot Cat photo has leaked under a NDA and was part of a controlled destructive test. 6). 1 gram of mass = 23,000 Megawatt hours. 1 gram of nickel = 23,000 Megawatt hours. 7). Rossi claims they are close to producing electricity. 8). An independent committee of international professors tested a Hot Cat in March for 120 straight hours and will be published in a peer-reviewed journal. 9). Research is primarily in Italy, but with a concentration of operations in the U.S. (Florida). Sweden is in the process of developing manufacturing capabilities as well. 10). There are 106 modules in one 1 Megawatt plant. Read notes here and here from the interviewers.